Up until now, if you’ve wanted to smoke your Ford Mustang’s rear tires without roasting your rear brakes, your best bet has been the V8 GT. 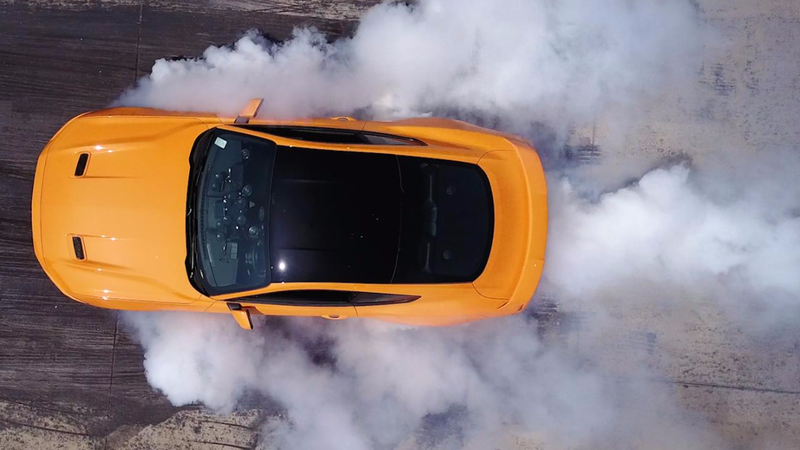 But now for 2018, Ford is making the Line Lock (“Burnout Mode”) feature standard across the Mustang range. Which is kind of absurd, if you think about it. But in a good way. Now even rental-spec Mustangs with the 2.3-liter turbo four and ten-speed automatic will get burnout mode. How the heck is anyone supposed to resist destroying their rental car tires now? Line Lock will be sitting there on the cluster, taunting them. Upon selecting line lock on the instrument cluster via the toggle switches, the brake system builds up brake fluid pressure in the front brake calipers. An additional press of the button locks that pressure in for 15 seconds, during which the driver can—and should—smash the crap out of that accelerator pedal and roast those meats. Line Lock on a base Mustang is sort of absurd. But if it gets more people out there ripping burnouts, I’m all for it. The world could always use more burnouts.